Cathy only wanted to go out on weekdays when there were not too many people so it would be easier for Mdm Chan, both Cathy and I had to take time off work for this pledge. But it was worth it after seeing how happy Madam Chan was. We started off with breakfast at The Loaf in Pavilion (one of my blog reader’s suggestion) and it was really nice. We sat by the glass window so Mdm Chan could have the view of cars passing by. The Loaf isn’t amazing for wheelchairs as it has so many levels, so Cathy and I took food for Mdm Chan. Retro in my Marc by Marc Jacobs sunnies! Hehe. After breakfast, we took Madam Chan around Pavilion. She has never been there after her stroke, so I think she was pretty excited. She kept pointing here and there to indicate to us where she wanted to go, so it was pretty easy taking her around. At her age, she really didn’t want to shop. 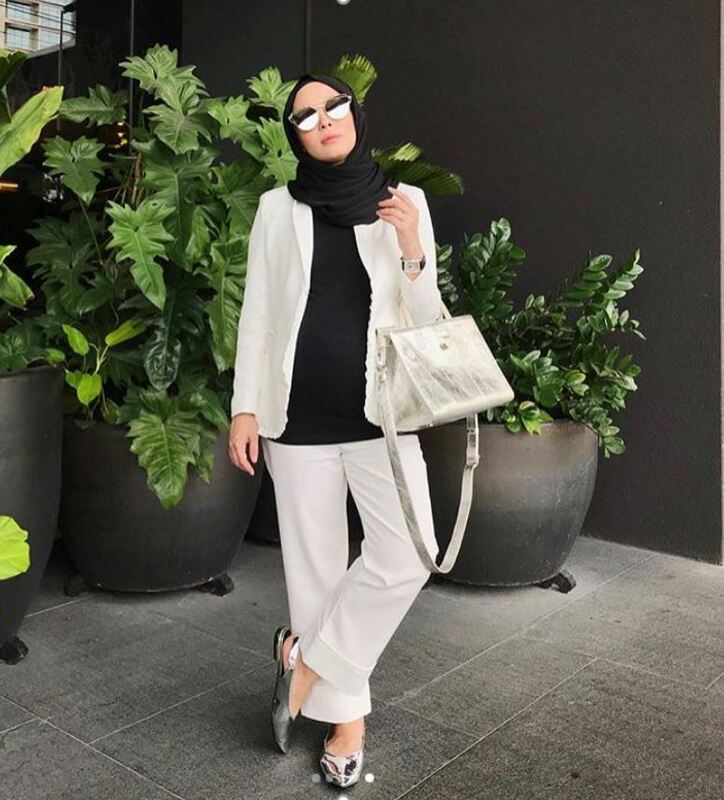 Shopping to her just means taking a stroll and jalan-jalan. Clearly our definitions of shopping differ, but hey, hers was pretty fun too! We passed by the food court and she pointed to food. Since it was lunchtime, the three of us sat at the food court and had chicken rice! Eating time again…weeee!! During the day, I had the opportunity to learn more about stroke patients but also interesting was what the whole family has to go through. Everybody has to learn to be patient and to be helpful, and really sacrifice a lot of their time because stroke patients really require a lot of attention. Mdm Chan cannot feel both her legs and her right arm, so her only movement is her left arm. 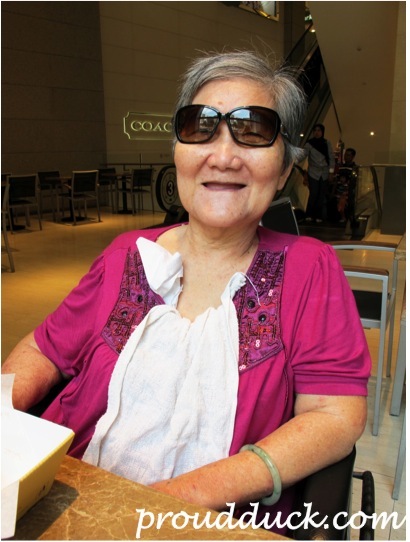 During the day, Cathy and her sister go to work and Mdm Chan’s 70 year-old husband takes care of her (if that isn’t true love, I don’t know what is…). When Cathy and her sister return from work, they take care of her. 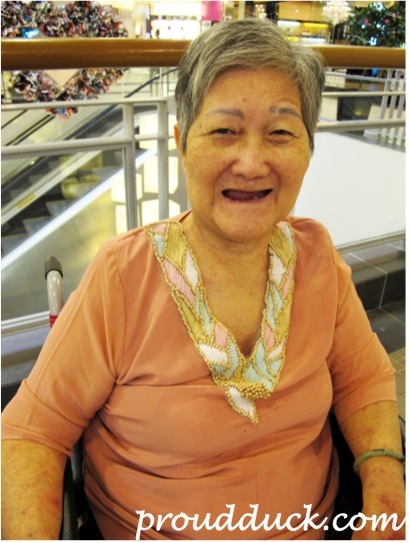 Every week, Mdm Chan goes to NASAM for her physiotherapy and Cathy has to take leave from work to bring her. 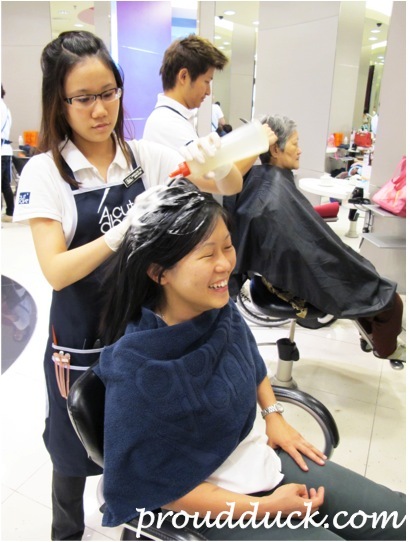 The way I saw Cathy care for Mdm Chan, it really touched me. 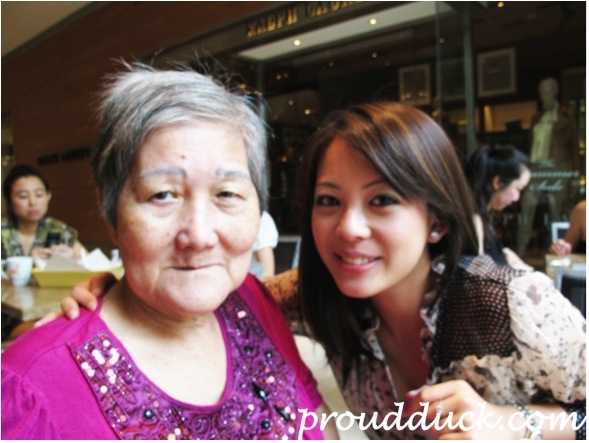 Mdm Chan has become her whole life, and Cathy has to forgo a lot of things because her mom is her priority. Mdm Chan actually cries if Cathy comes home late from work, so Cathy joked with me, “How to go dating like this? !” Hehe. In all seriousness, she did admit that it’s really hard to find a guy who would accept her mom as she is. And that is such a sad reality. 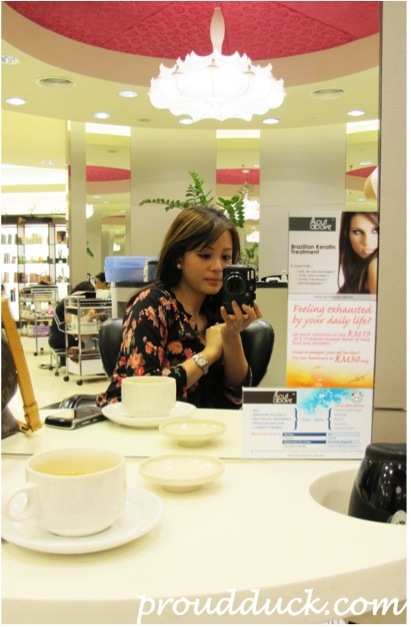 I thought it would be so nice to have a girly session with these 2 ladies, so where else but the hair salon? 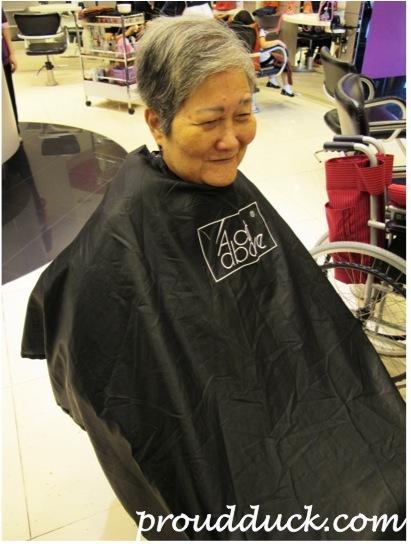 A cut above Bangsar Village II has kindly agreed to sponsor haircuts for these two lovely ladies, Mdm Chan and Cathy. Their stylists were Vlee Lau and Magdalene Tan. Thank you so much, you guys, for your kind participation in my pledge! Thank you, A Cut Above! 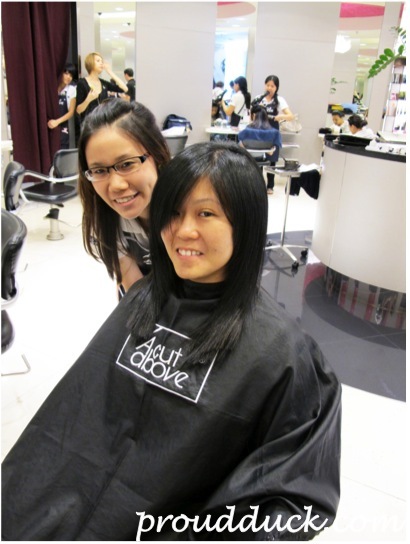 Mdm Chan and Cathy both got haircuts! Cathy had no idea because I had only told her it was for Mdm Chan. Thought it would be a nice surprise for her because she really deserves it for devoting so much love to her mother. They got bored of me, so I camwhored by myself hehe. My pledge has been fulfilled but it’s just not right to stop here. I’ll be sure to continue this friendship I have with Mdm Chan and Cathy! 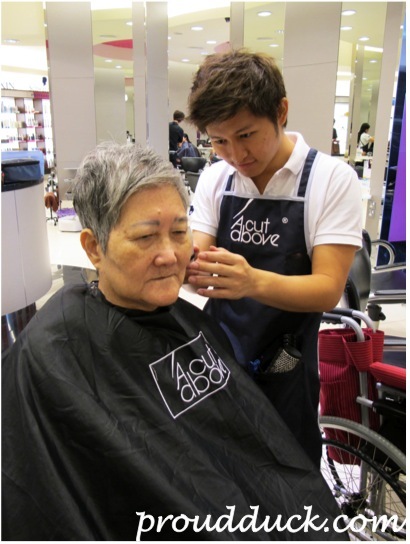 THANK YOU TO MIMPIKITA AND A CUT ABOVE FOR THEIR GENEROUS SPONSORSHIPS! 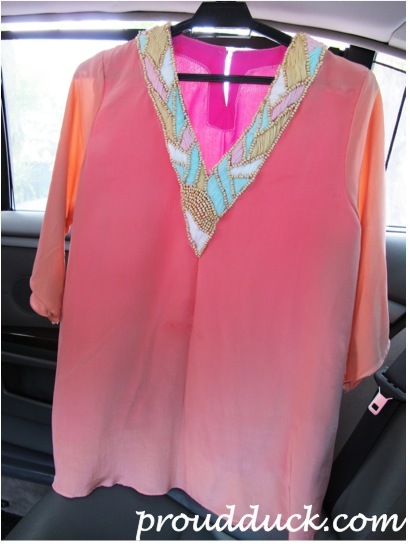 The mimpikita top looks pretty but i think it would be better if it is a button down top since mdm chan can move one of her arms. Just my personal opinion! nonetheless, you’ve done an awesome pledge! 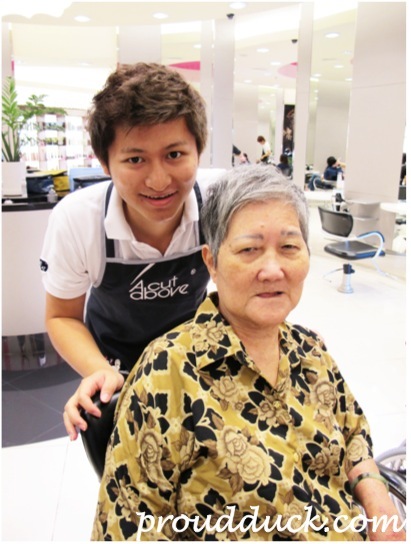 You have done a wonderful job, I’m sure Madam Chan and Cathy must be happy. 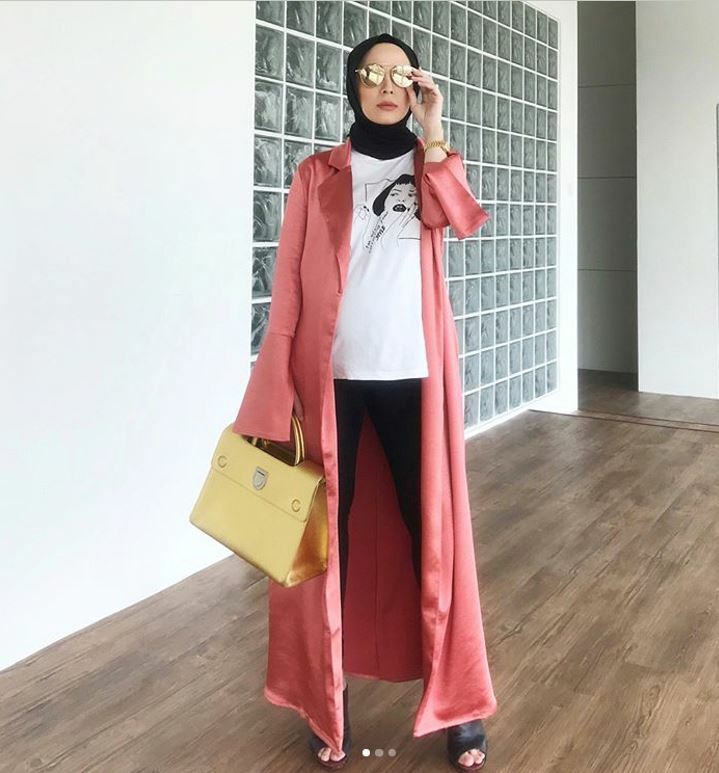 You and the other bloggers involved in TLC is demonstrating the true caring Malaysian spirit. Well done! Ooh you did take my suggestion to go to The Loaf heh, hope the pastries did not disappoint! This TLC pledge is a really nice thing to do. Salam – Dear PD, ur parent must b proud of u…. I’m a physiotherapy students and I cant wait to graduate and help more of these people. I love what you are doing, it’s applaudable!